Dates give you a pleasant soft feeling in the mouth, and their tasty sweetness makes them perfectly suitable for muesli, Christmas baking, fruit salad or as a snack. They have loads of fructose and are thus the ideal food for endurance and power athletes. In addition, they are easy to digest and help against indigestion. Dates are the fruit of the date palm at home in the desert areas of the Orient and Africa. The oblong to egg-shaped dates are the classical provisions of the desert nomads, they are popular all over the Near and Middle East all year long. 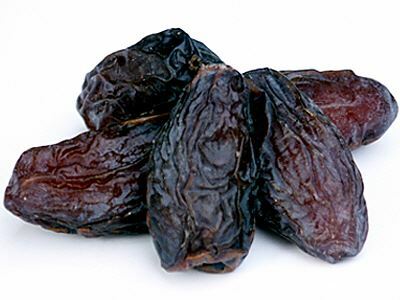 Dried dates have a water content of 20% and last long because of their sugar content of 60 to 70%. And they have loads of iron, zinc, phosphorus, magnesium and even 50% more potassium than bananas.